Leverage the highly targeted CRISPR/Cas9 System to insert a PinPoint attP site into the AAVS1 Safe Harbor Site for reliable gene expression. 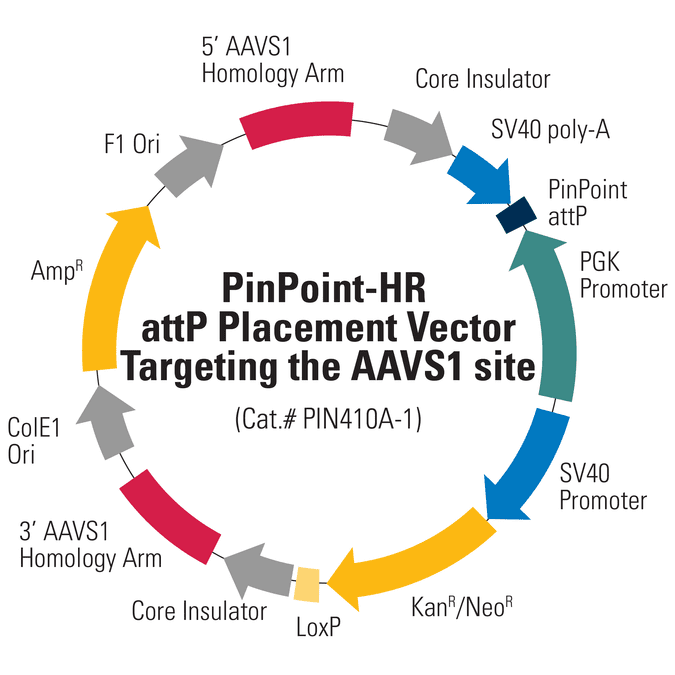 The PinPoint-HR attP Placement Vector Targeting AAVS1 contains both 5’ and 3’ homology arms to direct the vector to the AAVS1 site—use with the All-in-one Cas9 SmartNuclease and AAVS1 gRNA Vector (Cat.# CAS601A-1) to provide both Cas9 and AAVS1 gRNA. In addition to the PinPoint attP site, the PinPoint-HR attP Placement Vector contains a neomycin resistance gene for selection of integrants and a PGK promoter. The PGK promoter is positioned so that, in the second step of PinPoint integration, the PGK promoter will drive a promoterless puromycin gene supplied by any of SBI’s PinPoint Donor Vectors. Insertion of the PinPoint attP at the AAVS1 Safe Harbor site using the PinPoint-HR attP Placement Vector Targeting AAVS1 follows the basic gene knock-in process (Figure 1). After using the CRISPR/Cas9 System to place the PinPoint attP site at AAVS1, you can use the PinPoint Integrase and a PinPoint Donor Vector to insert your gene-of-interest into the PinPoint attP site. If you choose to use the PinPoint-HR attP Placement Vector to insert the PinPoint attP site, the PGK promoter on the Placement Vector combines with the promoterless puromycin marker on any of SBI’s PinPoint Donor Vectors, to enable puromycin selection only if the PinPoint Donor Vector integrates at the correct site.